George Horace Danby was born in Chester in 1877. He married Margaret Isabella Andrews in Liverpool on 13th September 1904. Their son, Horace George Danby was born on 29th March 1907. The 1911 Census showed the family living at 5, New Road, Rainhill, noting that one of their two children had died. This census listed George as an “Imbecile Attendant”. George enlisted in the Royal Army Medical Corps on 26th November 1915, as Private 83919 aged 37. years old, He was initially posted to the Army Reserve and was then called up for service on 14th July 1916, at the RAMC Depot at Aldershot. He went to India on 24th September 1916 and was stationed in Bombay. Georgewas admitted to hospital in Bombay on 3rd January 1917 suffering from extreme heat stroke. On 21st April he was discharged from India suffering from Endarteritis, an inflammation of the artery, and was sent to Suez, arriving on 3rd May. He then moved to Alexandria and on 23rd October, was returned to the UK, arriving on 5th May. His medical report on 20th December stated that he should be discharged as he was suffering from paraplegia. George was discharged on 10th January 1918 at Woking. He was 39 years old and was classed as “No longer physically fit for war service”. His character was noted as strong, honest and reliable. 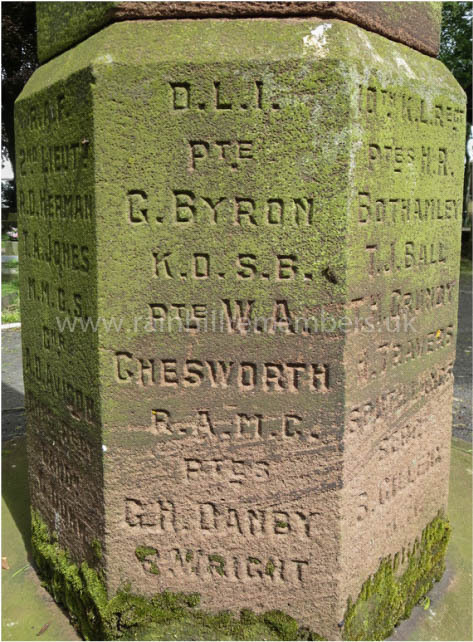 George Danby died on 5th May 1918 at the Northern Hospital, Liverpool. His cause of death was Amyotrophic Lateral Sclerosis, also known as Motor Neurone Disease. George’s service and death record are not commemorated by the Commonwealth War Graves Commission (CWGC). Many men died after discharge as a direct result of their military service, and provided that they died before the “cut off” date of 31st August 1921, they should be commemorated by CWGC. Stephen Nulty (Prescot Roll of Honour) has submitted George’s case for consideration by CWGC and hopes that recognition and commemoration of his death can be achieved. If this occurs, then CWGC will maintain the commemoration, which would normally involve either ensuring that his name is visible on a private grave headstone, or erecting a standard CWGC stone in the cemetery/churchyard where he rests. His grave has now been located in Anfield Cemetery and if CWHC accept him for commemoration, his name will be added to the Brookville Memorial. In June 2015 CWGC confirmed that having inspected George Danby’s grave at Anfield, they agree that the present headstone does not provide an appropriate memorial for him and so they have ordered a CWGC headstone which will be delivered and erected in due course. This has now been achieved. Medal entitlement: - British War Medal, Victory Medal, Silver War Badge. Private George Horace Danby of the Royal Army Medical Corps is remembered on the WWI Memorial in St. Ann's Churchyard, Rainhill.